Airflow is good. Circulating stagnant air has many health benefits, but what do you do when that ceiling fan is just making too much noise? To start, check all the normal suspects; is it balanced, cleaned, level, blah blah blah… You’ve probably already checked these anyway. It’s an older fan, the motor hums, because older fans hum. If it’s vibrating through the structure, there may be something you can do to isolate that extra vibration – and at least keep the other occupants happy. 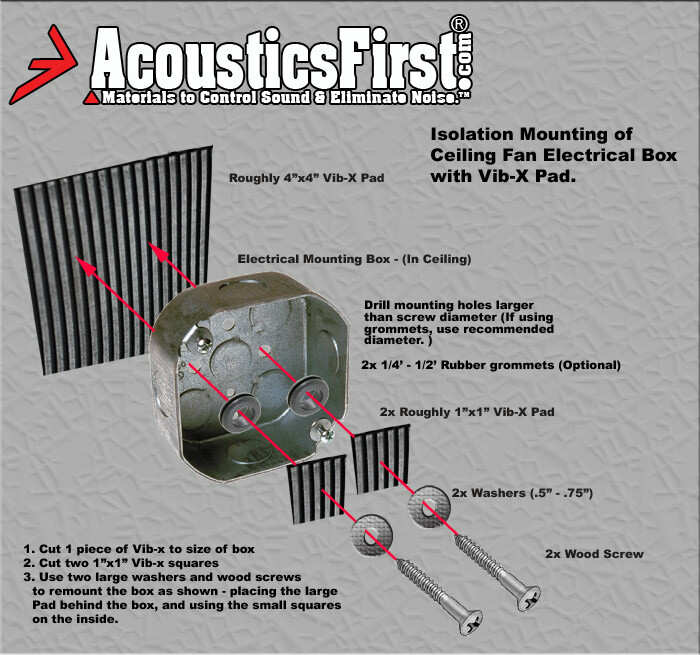 When most people think of Vib-X pads, they think of a musical function; Isolate your speakers, isolate an amplifier, isolate a (insert name of miscellaneous musical gear here)… but there are some really useful everyday functions for this wonderful material. Like keeping that fan from vibrating the entire house! Isolate that ceiling fan with Vib-X! The simple install may involve a contractor, or at least some one who knows electricity, so you don’t electrocute yourself… but after shutting off the power to the fan, it’s pretty quick. Take down the fan and find the box. Disconnect the box. Cut some Vib-X to separate the box from the wood. Cut some Vib-X squares to use as washers. Remount the box using the diagram, a couple fender washers, maybe a couple optional grommets if you desire – then re-install the fan. Ceiling fans are usually mounted to an electrical junction box in the ceiling, which is usually just screwed to a ceiling joist or some simple wooden frame. By using the Vib-X to isolate the electrical box from the wood, the vibrations do not directly transfer from the fan into the structure of the house, turning that old, vibrating ceiling fan – into a breath of fresh air. Simple. Thought so. Don’t forget to balance, level, and clean that ceiling fan while you’re doing all this. Turn that power back on and enjoy the breeze. This entry was posted on December 10, 2013, 9:35 am and is filed under DIY, HOW TO, Product Applications, Products. You can follow any responses to this entry through RSS 2.0. Responses are currently closed, but you can trackback from your own site.